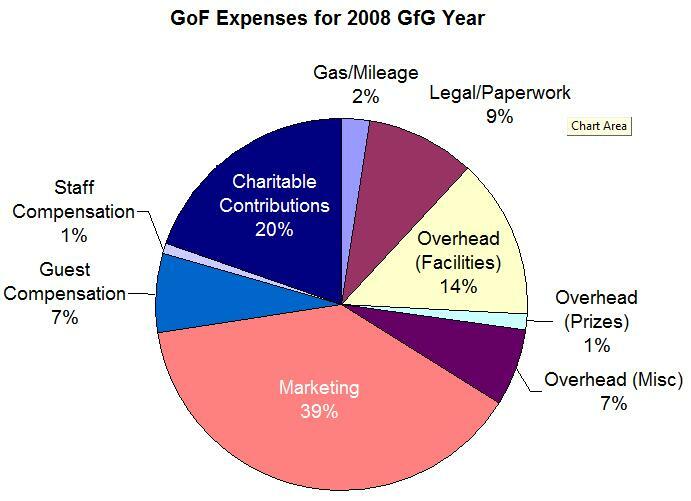 On May the 13th, Zach sent over a financial review of the 2008 Gamers for Giving event cycle (available here, untouched in .xls [Office 2003] or .ods [OpenOffice 2.4] formats). Let me begin by saying, with as little snark as I can muster, that my dearest hope is that whatever financial reporting they do officially (if and when that ever happens), it is not done by the same person who generated this report. I have worked with countless budgets done by amateurs and professionals alike, and while this is certainly not the absolute worst (I am the creator of the the worst I have ever seen), it is not a particularly distant second to that dubious honor. Nonetheless, I made a valiant attempt to wade through the mess that is this charity’s financial situation. As you can see, marketing efforts are currently making up a whopping 39% of the overall expenses; nearly double the amount actually donated to a charity (20%). Another disproportionately large expenditure would be that of “special guests”. Nearly 10% of the money spent by the organization was spent on one single guest, in all, some $1,300 for food, airfare and hotel fees for the guest and his companion. Even a cursory viewing of the report shows that this is an extraordinarily top-heavy organization, and that is a significant problem. It is also fairly significant to note that, to the best of my knowledge (and I would love to be proved wrong on this count), some of the largest expenses were not shopped around for bids. Specifically I speak in reference to the web site (an insanely overpriced Drupal money-sink created by a person reported to be friendly with several board members) and the monitors (purchased at retail from Best Buy). That is purely preposterous, and should be rectified immediately. Finally, it bears mentioning that the prizes are inaccurately represented here. The prizes for the LAN events are not reported here because they were picked up at no cost through sponsorships. The reporting inaccuracies are exacerbated by no mention of the $1,000 first prize and $500 second prize for the Halo 2v2 tournament. If that were added to the existing prizes, the resulting amount (nearly $1,800 in prizes) would account for about 53% of GfG’s inflow. The prizes, it would appear, are entirely too rich for the income that the event generates. It is simple arithmetic. If you are putting 180 people in the event at $25 per head, giving a pair of them $1000 and a pair of them $500 is entirely too large a percentage of your take. There is actually very little to say on the topic of income. As you can see, comparatively little money is actually generated by the Gamers Outreach portion of the event; an amount almost equaled by sponsorship income. In fact, half of the revenue generated was done so by the LAN side of the house. It is important to note that this is largely because MPCon was able to host the LAN using infrastructure that they own or that they were able to procure for the event. 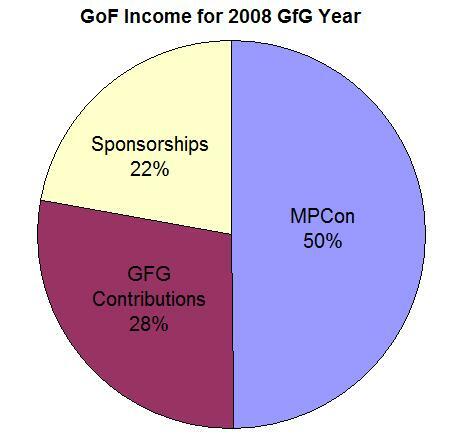 As MPCon and GoF have now split, the only way the GoF will be able to continue to create even as much income as it has would be in finding sources for free LAN infrastructure (such as an alternate organization like MPCon or through donations/sponsorships). The only other rational method would be through a gradual building process by which hardware is incrementally purchased or leased as the event grows. Place someone in charge of the finances that is trained in exactly that, financial reporting. Even if it costs some overhead, it will save a bundle in the future. Place someone in charge of managing the event that knows about running an event. The skills required to run a company are not the same skills that are required to run an event. While there is some overlap, there is a reason that CEOs pay project managers and event managers massive wads of cash to run events. Those skills exist for free within your community; harness that. Zach, you have clearly shown that you have a knack for publicity and getting noticed. You’ve also shown that you do not have the knack for running an event. Get someone involved that does and, if you are really excited about being hands-on, learn from them. Continuing this way, however, is a sure recipe for disaster. Get a budget. Adhere to that budget. At this point, the organization is less a charity and more a toy. Unless the next batch of financials report something amazingly different than these, any donations that you do make are largely accidental. Without sponsorships, your 2008 donation would have been a scant $1,400. Flying by the seat of your pants is great for a regular organization, but when you are purporting yourself to be a charity, you have a fiduciary responsibility. You are failing in that responsibility. While this is, by no means, a comprehensive list of fixes, taking these steps would set the charity on the road to actually behaving like a responsible, productive organization. Please check back, as I will continue to update as this year’s financials make their way into the public eye and (hopefully) repudiate the above statements. I look forward to the chance to admit that I am wrong and that the organization has entirely reformed their methodologies. GoFЉit is time to repair some things, fellas. The saga continues, read more in part 4, in which the 2009 financials are released!